Each month, one PPAedu video is unlocked for everyone to enjoy, because we believe in the power of education for all (it's normally reserved only for PPA members)! The PPAedu library is filled with tutorials and educational videos to help you sharpen your photography techniques, marketing strategies, sales techniques, and business operations, available 24/7 to PPA members. Between PPAedu and PhotoVision, as a PPA member, you can tap into hundreds of programs to help you Be More! If you haven't checked out PhotoVision, take a look; the website is filled with episodes on demand! For the month of November, the video "Secrets to a Successful Holiday Portrait Event" with Beth Forester has been unlocked. This video delves into the key elements to Beth's wildly successful Holiday Mini Portrait Event at Beth Forester Photography. 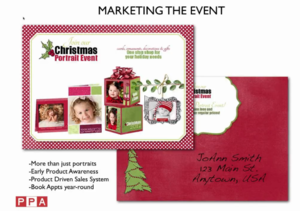 Last year her Holiday Mini Portrait Event yielded over $20k in sales in just 3 days. You'll leave this program with all the inside scoop on running your own Holiday Mini Portrait Event! If you're a member of PPA, just log in to watch the video anytime. Non-members will have access to this video this month only at PPA.com/TryEdu. For full access to all the PPAedu and PhotoVision videos, join PPA today! Bethany Clark manages all things social media for PPA. When she's not living on the internet, she loves writing, sewing, travel, yoga, and of course photography.